Special Carlsbadistan thanks going out to who ever dumped their prized used oil collection into a storm drain this afternoon. A city employee working on a sewer project in the area of Chinquapin Avenue and Long Place first reported a pollutant running from a storm drain at 1:30 p.m. this afternoon, Carlsbad Public Works Department Supervisor Don Wasko said. . . . A few gallons of what looks like used motor oil have so far drained into the lagoon, Wasko said, with much of it being absorbed by special filters that clean-up crews have put in place. Luckily, if the person was dumb enough to get caught, they’ll be paying for the Agua Hedionda Lagoon clean up. It’s possible. On January 23, 2008 we told you the story of how home-owner Marty Ummel, 60, was suing her Realtor Mike Little because he “hid the information that similar homes in the neighborhood were selling for less because he feared she would back out and he would lose his $30,000 commission.” Eventually, Ummel and her husband even appeared on NBC’s Today Show. Tomorrow, Vernon and Marty Ummel, who purchased a $1.2 million home in Carlsbad three years ago, will try to convince a jury that their real estate agent defrauded them when he failed to inform them that similar houses on the same block were selling for more than $100,000 less than what the Ummels had paid. . . . Jury selection is expected to begin tomorrow morning in the Vista courtroom of Superior Court Judge Lisa Guy-Schall. This should be interesting. Especially for the Real Estate industry. Carlsbad resident Jeffery Collins O’Neill, 24, has been arrested by Eagle County Colorado Sheriff’s on “suspicion of two counts of criminal impersonation and forgery and one count of second-degree trespassing,” according to a story in the Vail Daily. O’Neill allegedly . . .
. . . charged $7,000 in sporting goods at Beaver Creek Sports to several Ritz-Carlton guests . . charged almost $1,300 to a hotel guest’s room and more than $930 to another guest’s room March 22. . . O’Neill also bought almost $5,000 in sporting goods using different names in February, though he denied being there that month, the report said. Sounds like someone was getting a little too greedy being around all those rich people. 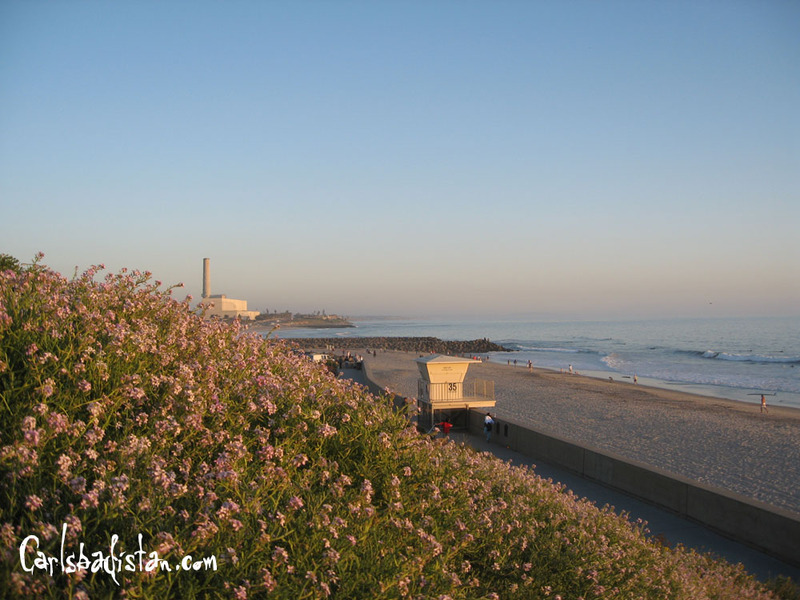 A 29-year-old man drowned March 30, 2008 when he fell from an unstable dock while fishing in a Carlsbad Pond. His friends told police they tried to rescue the man, who could not swim, but had trouble finding him in the murky water. The pond is located at 3004 Sunny Creek Road. The California Association of Realtors just released their home sales number for the month of February and turns out that Carlsbad is number 11 on the top 10 list for cities with the highest median home sales price. Number one was Santa Barbara at $1,150,000 and we came in right behind San Francisco with a median price of $675,000. We were also fifth on the top 10 list of cities whose median home prices grew the most over February of 2007. When you look at how the state did as a whole, we’d say we’re doing pretty well here in Carlsbadistan. Indeed. If all retail outlets marketed their products the way wine shops do, there would be coffee sampling at Starbucks, shot putting at Dini’s, and burrito testing at Cessy’s. 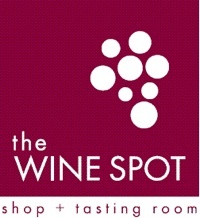 What this means is that they will be selling wine by the glass to customers without telling them what they’re drinking. How great is that? Give them money and they’ll serve whatever they want. If this sounds appealing, drop by The Wine Spot at 2801 Roosevelt St. any time this weekend and drink like a fool. Fidel Lopez Mundo, 38, and Ramon Gutierrez Lopez, 23, were arrested yesterday for burglarizing a vehicle at a restaurant (King’s Fish House?) in the 5600 block of Paseo del Norte, according to a story in the North County Times. The restaurant has been the scene of at least six burglaries from full-sized GMC vehicles recently, police said. . . The Yukon belonged to Charter Jet Service from Palomar Airport and had been burglarized, Sutt said. A laptop computer had been stolen but was later recovered, according to officials. Sounds like someone has a skeleton key. 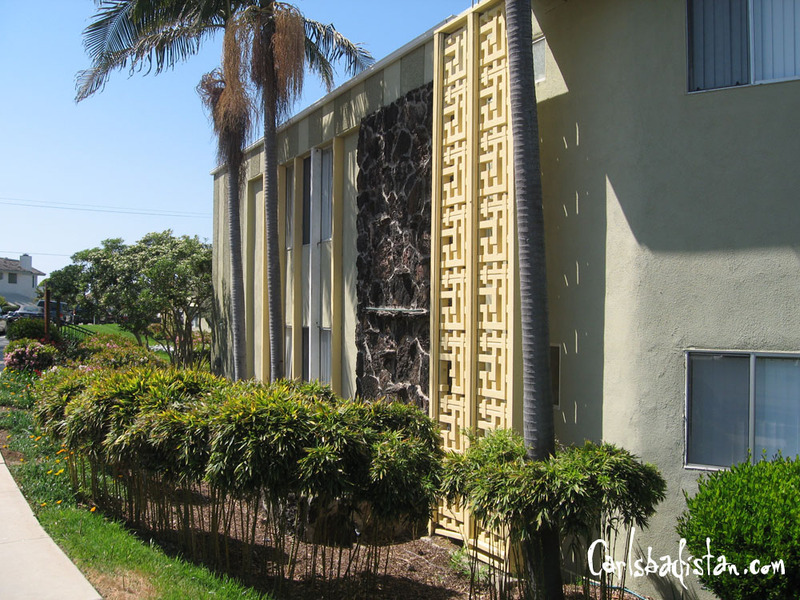 Say good-bye to the classic mid-centuy, tiki stylings of the Ocean Street Apartments overlooking the lagoon at 2303 Ocean Street on Carlsbadistan’s northern border. 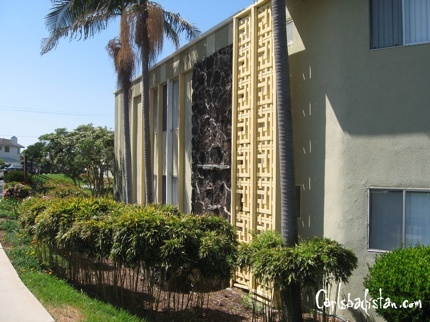 According to the City of Carlsbad those 50 units are getting demolished so 2303 Investors, LP can put in “35 residential Airspace condominiums” with underground parking. While neighbors are probably happy to see 50 rental units worth of problems wiped off the face of the map, it will be sad to see the old place go. 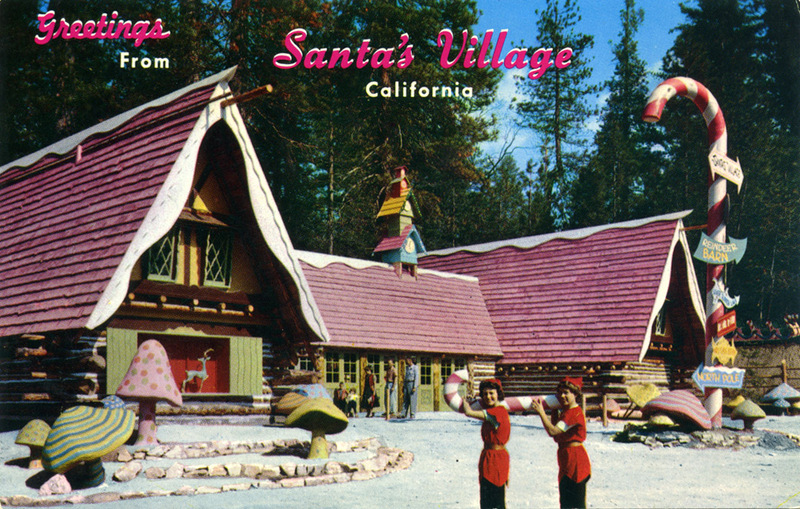 Pieces of the old Lake Arrowhead area Santa’s Village have made their way to Carlsbad’s Flower Fields according to a story in The Press-Enterprise. The old tourist landmark (which opened before Disneyland in 1955) closed in 1998, but a couple pieces have made their way to the beach. The Flower Fields is another family business. Its CMO, Paul Ecke III, remembered Santa’s Village from childhood and bought many of its structures at auction after it closed. 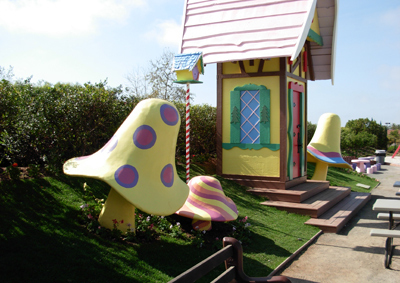 . . .According to a press release, he was bidding against comedian Paul Reubens, of “Pee-wee’s Playhouse” fame. . . . Ecke came away with the Gate House; the Crooked Treehouse; tiny picnic tables with seats made from pouring cement into five-gallon buckets; and many of the giant mushrooms that dotted the landscape. 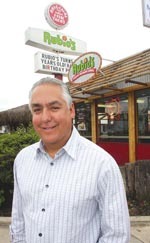 It was 25 years ago that Ralph Rubio and his father founded the Carlsbad-based Rubio’s Fresh Mexican Grill and made fish tacos the official food on San Diego, according to a story in the San Diego Business Journal. With $16,000 from his father, Rubio, a 1978 graduate of San Diego State University, launched the company that made the fish taco San Diego’s signature dish in January 1983. . . .The idea for Rubio’s Fresh Mexican Grill came from excursions to Baja California, where Rubio and his college buddies dined in cantinas and at little stands lining the avenidas. . . .“My father and I talked about the concept for a long time, and then finally we did it,” he said. Linking this up this story is making us hungry. Follow the link for the rest of the story, we’re going out to one of their 170 shops for some fresh fish tacos.